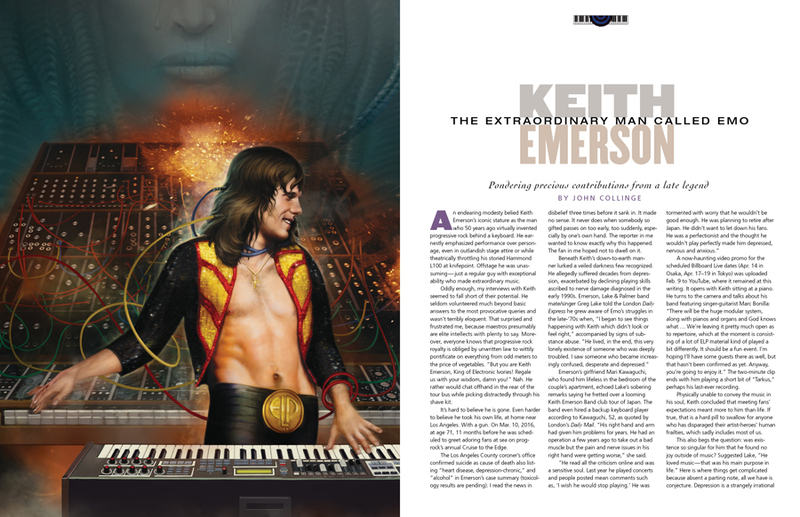 Keith Emerson (2 November 1944 – 10 March 2016) was an English keyboardist and composer. He became internationally famous for his work with the Nice in the late 1960s, which included writing rock arrangements of classical music. After leaving the Nice in 1970, he was a founding member of Emerson, Lake & Palmer (ELP), one of the early progressive rock supergroups. Emerson, Lake & Palmer were commercially successful through much of the 1970s, becoming one of the best-known progressive rock groups of the era. Emerson wrote and arranged much of ELP’s music combining his own original compositions with classical or traditional pieces adapted into a rock format. After ELP disbanded, Emerson resumed his solo career, with numerous projects including touring with his own Keith Emerson Band and collaborating with several orchestras, as well as movie soundtracks. ELP reunited one last time to headline The High Voltage Festival for their 40th anniversary in East London on July 25, 2010. You can find a factual biography of his projects and works on Wikipedia, but one thing is certain: we will miss this extraordinary man. He has been described as perhaps the greatest, most technically accomplished keyboardist in rock history. Progression Magazine has just shipped issue #69 with a 10 page tribute to Keith, among other notable feature articles. Progression Magazine has been re-designed and this will be its premier issue under a new art director.